BJP's two tall women ministers Nirmala Sitharaman and Sushma Swaraj are firefighting for the party and how. 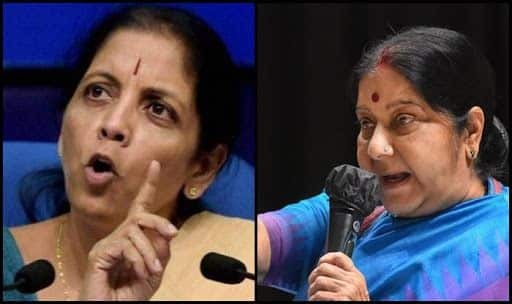 New Delhi: A day after overseas chief of Congress Sam Pitroda referred to the Pulwama terror strike as ‘attacks happen all the time’ and criticised the Modi government for its retaliatory action, BJP’s two senior women ministers took the fight head-on. On the other hand, External Affairs Minister Sushma Swaraj in a separate public event hailed the Modi government’s new no-tolerance policy against terrorism and its diplomatic win in the Pulwama attack aftermath. BJP national president Amit Shah on Saturday also condemned Pitroda’s comments and demanded an apology from Rahul Gandhi. I demand from the Congress President that he must apologise to the families of the slain troopers,” Shah told the media in New Delhi.